July 10, 2014. Water flowing into a eutrophic lake from agricultural fields. Algae is already abundant in the stream where it has grown due to high nutrients and temperatures. Credit: John A. Downing/Minnesota Sea Grant. What's wrong with being green? Toxins released by algal blooms can ruin drinking water. 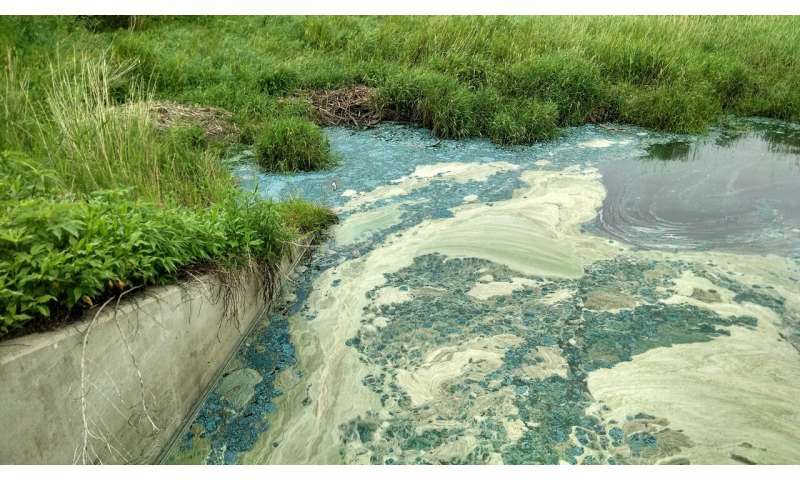 When dense algae blooms die, the bacteria that decompose the algae also deplete oxygen in the water. Without oxygen, fish and other animals suffocate. Globally, such green waters are also an important contributor to atmospheric methane—a greenhouse gas that is up to 34 times more potent than carbon dioxide. July 10, 2014. Water flowing into a eutrophic lake from agricultural fields. Algae is already abundant in the stream where it has grown due to high nutrients and temperatures. The background shows rich and productive agricultural lands. Credit: John A. Downing/Minnesota Sea Grant. "It is really surprising how much eutrophication could increase in the next 50 to 100 years," said co-author John A. Downing of the University of Minnesota Sea Grant program. 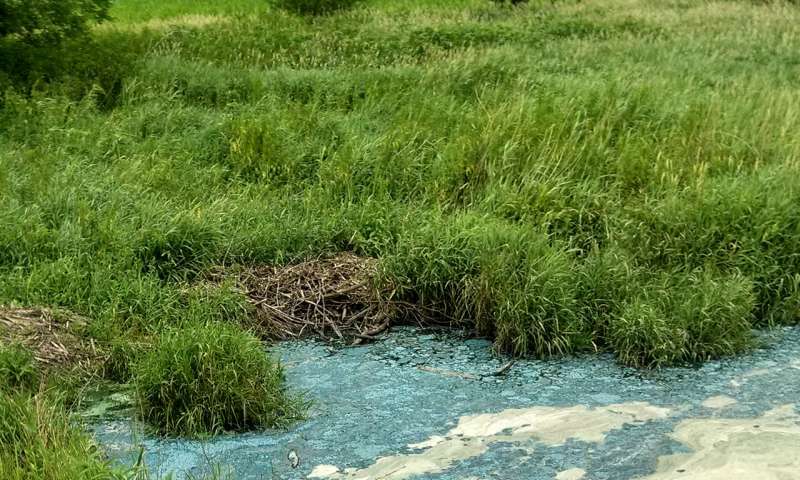 "People do four important things that affect eutrophication: they eat, they excrete, they make more people who eat and excrete, and they alter landscapes and climate," said Downing. "We used phosphorus because the relationship between phosphorus and plant or algae growth is well established," said co-author Tonya DelSontro of the University of Geneva. "Currently, the single largest source of atmospheric methane is wetlands. If the phosphorus in lakes triples, then methane emissions from lakes could be twice that of wetlands." "In keeping and improving the quality of our fresh water we win twice," said Downing. "Once in the atmosphere and once back down here on Earth." 30-90%? 25-200%? The range of estimates is so large as to be meaningless. The assumptions, as always with the Malthusian Death Cult, are for "more of the same" extrapolated to the Nth degree. Malthus projected mass starvation by the middle of the 19th century due to population growth outstripping food supply. He was wrong, obviously, and his "co-religionists" continue to make the same fundamental mistake: to assume that future conditions will resemble the present, then apply the algorithms based on present conditions to model that future. This is science? No, it is statistics. The purpose is not to predict a real future, it is to affect the real present: "be afraid, be very afraid --- and pay your carbon taxes with a song in your green heart! So even though starvation exists in parts of the world today, we don't need to believe statistics, or statistics based on scientific research are all exaggerated? Research indicates that climate change will likely result in reduced crops due to extreme flooding and drought, as well as global warming and pollution of fresh water supplies.